UM Football fan? Me neither. But we've got a healthy respect for the achievements of the pre-Bo players and coaches that have shaped the traditions that the block M is built on. Hand-drawn with ink on birchbark, these 5x7 portraits are framed between two pieces of .375" glass and are available at the UMMA Store Monday-Saturday 11-5, Sunday 12-5 or online at umma.umich.edu/store. In addition to the portraits shown above, Benny Oosterbaan, Fritz Crisler, John Maulbetsch, Ron Kramer and Willis Ward are also available. Milt Wilcox Ink on paper, 23" x 25.5" Ron LeFlore Ink on paper, 23" x 25.5"
On May 20 and 21 we'll be hosting a studio art sale at our home in Chelsea. Among the available work will be several drawings of 1979 Detroit Tigers, based on the Topps baseball cards (which I have managed to hang on to for almost forty years). Need a Lou Whitaker? Sorry, didn't have his card. However, there are plenty of '79 Tigers to choose from to embellish the walls of your man cave. An array of new and not-so-new work will be available at our studio sale this coming May. Many pieces, including those pictured here, will be presented in custom, blackened cedar frames. 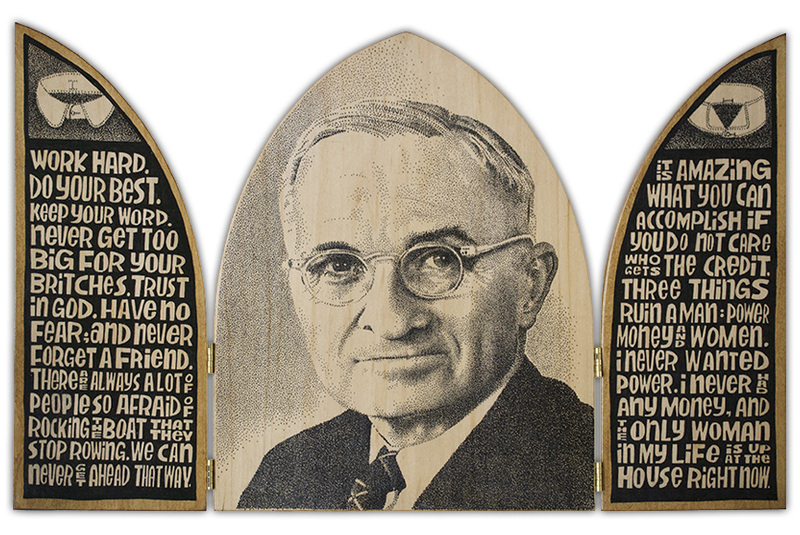 Ink on basswood panel, 18" x 12"
President Truman is highly respected by the husband of a friend. Said friend commissioned 12 Acre Studio to create a memento of the the 33rd president of the United States. The bonus to this project was combing through the trove of quotes and utterances that are attributed to Truman, and then wedging as many of them as possible into the side panels. 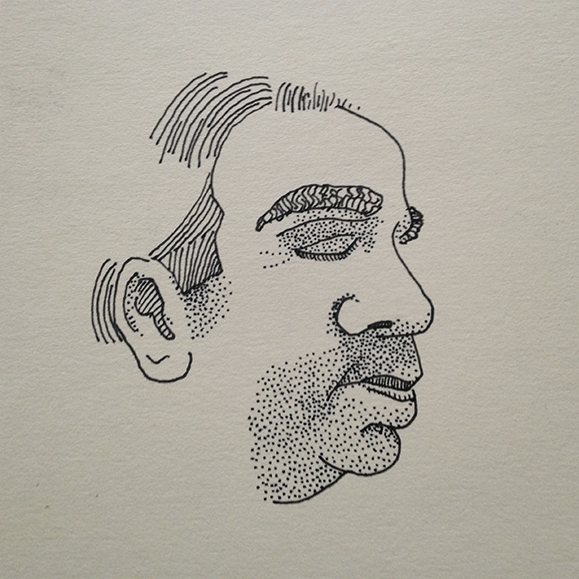 Maybe you are in need of portrait, be it friend, partner, family member or hero. Shall we? The Ann Arbor Convention and Visitors Bureau has created a Sports Commission to help attract sporting events to the area. With facilities on the University of Michigan campus, including Michigan Stadium, as well as Eastern Michigan and the local high schools, there's plenty of venues for a variety of events. 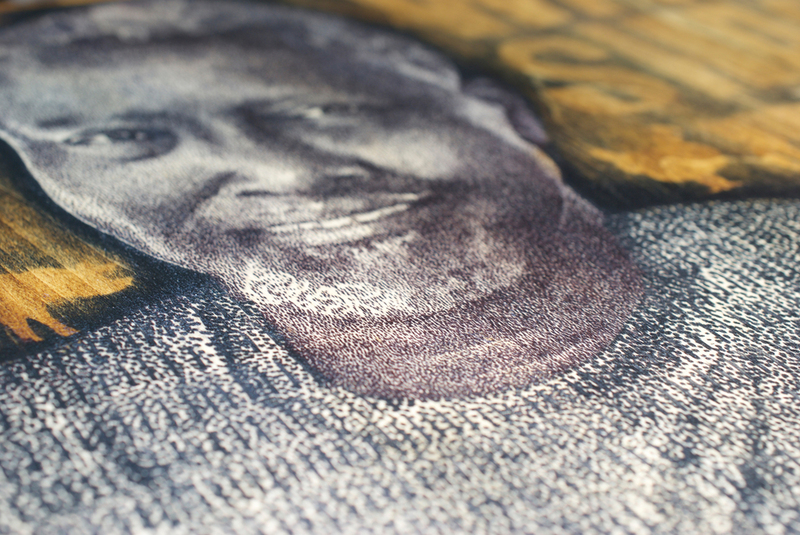 12 Acre Studio was asked to create portraits of local legends for the Sports Commission offices. Bo Schembechler, Gerald Ford and Willis Ward all left their mark on the UM football program, and each embodied the spirit of competition and sportsmanship that extended beyond the field of play. Ink on aspen panels, 24" x 36". Recently had the good fortune to work on a portrait of author Tony Hillerman for New Mexico Magazine (October 2015 issue). Hillerman was a best-selling author of crime and mystery novels that usually took place in the southwest and featured Native American characters and culture. In addition, it sounds like he was a helluva nice guy. When you're driving through Nashville and you pass a cinder block building with BROTHER Z's WANG SHACK painted on the side, you best stop and see/taste what it's all about. Barbecue done right. You can head to the enclosure out back, equipped with an electric organ for Sunday morning services, or take a seat at the picnic table next to the parking lot. Either way, it's worth the wait for the wings or ribs that Brother Z prepares and delivers himself. 1407 Dickerson Road in Nashville. I spent several years as an art director at Perich Advertising + Design in Ann Arbor, Michigan. That means I spent several hours in meetings, creative reviews, conference calls, etc. 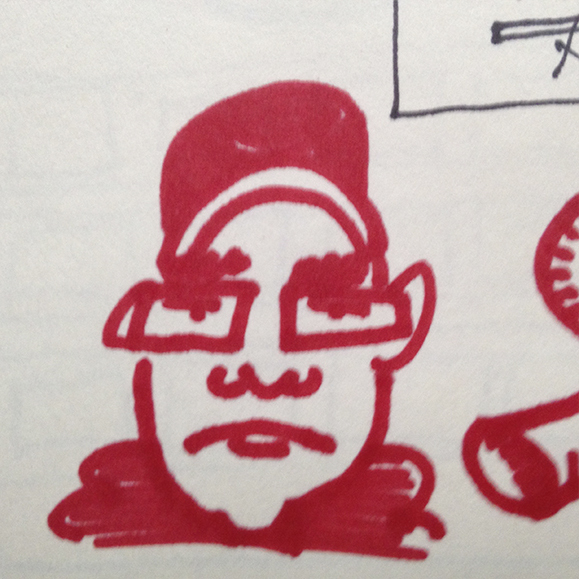 While I took a lot of notes I also spent time drawing the other Perich staff members. Ernie Perich, the founder and chairman of the outfit, was in many of these get-togethers and he was more often than not the focus of the gathering. Naturally, I would be looking at Ernie, busily "taking notes" as he orchestrated the assembly. 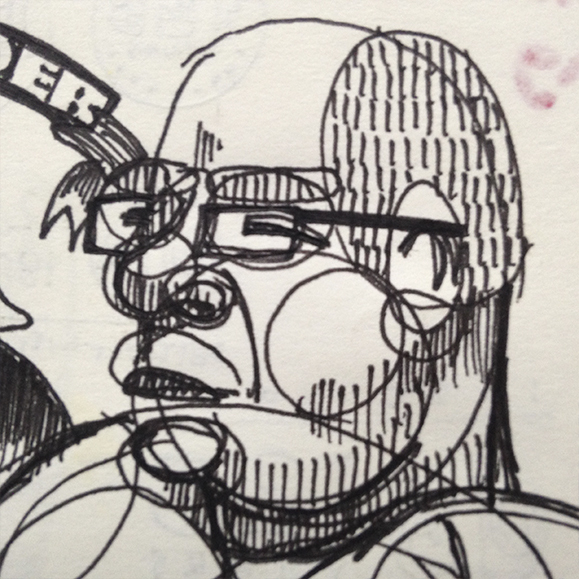 Here are samples of what I was drawing in an effort to stay awake. He's a hat guy, in case you hadn't noticed. Apparently someone laid this moniker on George Carlin: a modern day philosopher. I believe it was meant to describe Carlin in particular and possibly stand-up comedians in general. Comic Danny Lobell hosts a comic guest each week and pairs him (or her?) with a philosopher that you've probably heard of and possibly know nothing about. They open with the usual celebrity banter and gradually work up to discussing the chosen thinker. It ain't deep, and that's just fine. It's a fun conceit, and Lobell sounds sincerely interested in the comics that are his guests. It airs once-a-week so burnout isn't a factor (take note daily podcasters) and I look forward to each week's effort. The archived editions are worth trolling through, there are gems to be had. Hosted by Mark Malkoff, The Carson Podcast wanders down memory lane in search of anyone who was a Tonight Show with Johnny Carson guest, writer, or behind the scenes player. Malkoff is an ardent fan of Carson and the Tonight Show and does thorough research--- guests are often surprised at his encyclopedic knowledge of everything Johnny. Carson is rapidly fading into the dark shadows of television history, but if you are old enough to have been a viewer and enough of a fan of pop entertainment, there's plenty of interesting backstage gossip and storytelling. But if I hear that Fred DeCordova story one more time... oy.